In bestimmten Testphasen von Weblösungen stelle ich mit Hilfe von Add-Ons oder auch über die in FF integrierten Developer-Tools öfter den Cache meines Lieblingsbrowsers Browsers ab. Im alten Firefox (etwa der unter Opensuse Leap 42.3 ausgelieferten FF-Version 52.8 ESR) gab es im Add-On "Web Developer" lange Zeit eine Möglichkeit zum dauerhaften Ab- und Anstellen des FF-Caches. Diese Möglichkeit bietet selbiges Add-On unter Quantum nicht mehr. Nach dem Update auf Quantum wurden keine Dateien mehr aus dem Cache gezogen - die Netzanalyse in den FF-eigenen Entwicklertools zeigte ein permanentes Nachladen aller Seitenelemente an. Das führt beim Wechseln zwischen den Seiten einer Web-Site, bei denen größere Hintergrundsbilder angezeigt werden, typischerweise zu spürbaren Verzögerungen und ggf. zu Flacker-Effekten. An diesen Effekten haben wir gemerkt, dass etwas nicht mehr stimmte. Eigentlich wäre das auch OK - schließlich hatte ich die Einstellung ja selbst gewählt. Irritierend ist aber, dass man in keinem Entwicklertool irgendwo eine Information zum dauerhaft deaktivierten Cache sehen würde. Mit den in FF integrierten Entwickler-Tools (unter dem Menü "Extras >> Web-Entwickler ..." findet man etwa im Bereich der "Netzwerkanalyse" eine Möglichkeit, den Cache temporär ab- und wieder anzuschalten. Eine Abschaltung für den gesamten Zeitraum, in dem man die Entwickler-Toolpalette nutzt, bietet auch der dortige Punkt "Werkzeugkasten-Einstellungen". Diese Einstellungen sind aber sitespezifisch wie temporär und verschwinden spätestens mit dem Schließen des FF-Developer-Werkzeugkastens. Leider zeigten die genannten Werkzeuge nach dem Update auf Quantum nicht an, dass der Cache deaktiviert war. War er aber. Wegen der Einstellmöglichkeiten und der zuletzt getroffenen Wahl unter der alten FF-Version. Bei mir waren die Werte für "browser.cache.disk.enable" und "browser.cache.memory.enable" leider auf "false" gesetzt. Man stelle diese Werte auf "true" um - und schon funktioniert der FF-Cache wieder! Für das temporäre Abschalten nutzt man die Optionen im FF-eigenen Entwickler-Werkzeugkasten. Mir reicht diese Möglichkeit zum temporären Abschalten in der Regel für das Testen von Webseiten. Leider gibt es hier unter Quantum wohl noch Bugs: Die Kuchendiagramme des Punktes "Netzwerkanalyse starten" weisen bei vielen Seiten aus meiner Sicht fehlerhafterweise nicht aus, was unter Nutzung des Caches passieren würde. Angezeigt wird dort für bestimmte Sites "Antworten aus dem Cache:0". Obwohl die reguläre Darstellung der Downloadzeiten für die Seitenelemente mittels "Balkendiagrammen" die Nutzung des Caches mit korrekten Werten ausweist. Dennoch viel Spaß weiterhin mit FF. If no other precisely defined height scale is given the (min-) height of the innermost inline element - in our case an inline block - will be interpreted as if a letter of a corresponding font-size were present. We have shown that the baseline for letters indeed is set to the bottom of the innermost inline block if no (relatively positioned) contents of the innermost inline block is given. If our explanation of the gap occurrence has some truth in it we should see an effect when we reduce the line-height for the inline-blocks in their containers. Not quite, what we wanted. At least div.mp_cont shrank to the expected height. But, still, there is no defined inline-block height available and the browser still does not know what to do about the inline element div.hornav. Hence the vertical gap between div.hornav_txt and div.hornav. Yes! Now, we have at least found a remedy in case that we need to control the height for inline boxes with empty or absolutely positioned contents. Let us keep this option of line-height reduction in mind! Set the CSS value of "position" for the innermost block element div.fg to "relative" instead of "absolute". The innermost contents shall control the height expansion of all containers in a dynamical, flexible way. This is especially important for responsive layouts and CMS systems. A bit frustrating, isn't it? We gained nothing compared with our original example. But our finding is still consistent with our theory - we still have no defined height of an innermost inline element. and, hey, everything gets fixed in the sense of our original expectations. If we had started with the very reasonable setting of our last test we would never have noted any problem in our example. So, why all the fuss? One reason is that there are a lot of articles on the Internet about uncontrollable vertical gaps related to inline block elements. Actually these gaps are understandable and controllable. The other reason is that in templates (e.g. for CMS systems) the (future) contents of inline-blocks may not be known - and the inline block elements may intentionally be left empty. Then we would run into the described situation of our example. The use of nested inline blocks on the other side makes horizontal centering easy if the width of the innermost contents is not really known. Provide an innermost inline (text) element with a defined height (e.g. given by a font-size). This innermost element may be a "&nbsp;". Ensure that the innermost inline element can have an impact on outer containers via relative (!) positioning. Of course, you may/must in some situations also combine these options. Note: The use of a "&nbsp;" may be helpful for (PHP) templates as a dummy contents. Just replace this dummy text during the creation of the real page by real contents - eg. the text of a real menu point. What about <P>-tags with different font-sizes as the innermost tags? A <p> may actually create vertical gaps again - despite the fact there is enough space for it inside its block container div.fg. One of the reasons is that browsers add their own bit of white space to a <p>. This can be controlled by margin- and padding-settings. However, in our case of a a <p> inside inline-blocks even a "margin-top:0; margin-bottom:0;" does not help. For real CSS2/3 experts this may not be too surprising; for me it was. -tag really exceeds the height and line-height of the surrounding container? What did we change ? We explicitly set the line-heights for div.hornav and div.hornav_txt to zero. The second important point is that when the font gets too large we must adjust the line-height for the container div.fg. We use "line-height:normal;" to adjust the line-height to the height of the included contents. So, in case you should build a CMS in which the user can choose font-sizes by himself this is something you have to take care about. You may provide a standard setting; but if in situations like in our example case the font size of a <P>-tag exceeds defined limits our page creation program has to modify style settings explicitly to guarantee a flexible height adjustment. Easy horizontal centering via the use of (nested) inline block elements (even if the content length gets bigger than some threshold). Vertical flexibility - even if we work with font-sizes bigger than a threshold. 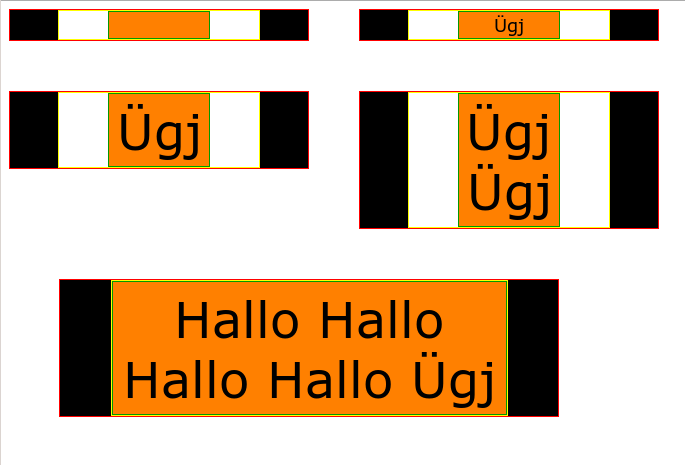 NO VERTICAL GAPS between (nested) containers of inline-block elements. It is easy to see how we can use the discussed elements in templates to create horizontally centered menus with menu points for which the horizontal and vertical size is not known. CSS is a bit weird sometimes - but fun, too!